Among the questions that we are most frequently asked with regard to suggest matings is "what about the inbreeding to....?" or "is inbreeding to x a good thing?" Unfortunately, as a generalized question, there is no simple straightforward answer, and so our reply usually starts with a "Well, it depends...."
While this might appear to be equivocating, it is not without good reason.The assumption that is being made in selecting an individual to inbreed to is that the 'good genes' that they themselves had as runners will by inbreeding result in these genes manifesting themselves in the target offspring. While genetically this may not be the exact mechanism that is taking place, there is enough evidence in some cases to suggest statistically that this has some merit. However, like much of statistical analysis with regard to thoroughbred pedigrees, examining inbreeding is no easy matter, or at least, to be more accurate extracting, meaningful data with regard to inbreeding from a very "noisy" background is not as simple as one would think. In fact in general across groups of similar commercial value, the degree of inbreeding in the stakes winning segment as far as duplications of a single ancestor is concerned, will tend to be in direct proportion to the population as a whole. The situation can also become very muddy when considering a inbreeding to any single ancestor, especially when it an ancestor who has established thriving sire lines, as in general, and in isolation crossing a mare back under a stallion from her own direct sire line (we know that there are countless examples of successes that run contrary to this statement, but as a general principle it still holds good: for example around 10 years ago we looked at all horses bred on a Northern Dancer/Northern Dancer cross with Northern Dancer 4 x 4 or closer. At the time there were 489 stakes winners on the cross, but statistically both the stallions and mares involved did better when crossed back over or under all other lines. In fact, Northern Dancer/Northern Dancer crosses produced stakes winners at only 0.44% of the rate opportunity suggested, equal to a TrueNicks rating of D. Thus any ancestor that is frequently represented through male line/male line crosses is likely to see that factor negatively impact his figures as a subject for inbreeding. Despite some noted iconoclasts - the most famous of whom was probably Marcel Boussac - close inbreeding tends to come under particularly close scrutiny. This is probably in part due to social taboos, and to a point not with out reason, as close inbreeding can facilitate the unanticipated appearance of negative recessive traits (although this is less of a problem in a breed such as the thoroughbred, which is bred for function, and where fairly rigorous culling has taken place). Still, in general, when dealing with very high-level stock of similar aptitude, we personally tend avoid very close inbreeding, partly because of the above, and partly because we think that we may gain more by introducing in complimentary variants for performance. We do, however, have a strong conviction that in trying to upgrade less expensive stock close inbreeding, especially through related sources can pay real dividends, and we were reminded again of this by the victory of the filly, Miss Steele, in the SAJC Proud Miss Stakes (gr. III) at Morphettville on May 10. Miss Steele is by Statue of Liberty (TrueNicks,SRO), a son of Storm Cat out of a three-quarters sister to A.P. Indy. Statue of Liberty has been a very useful sire given that he's always stood at a modest fee, but Miss Steele is only his fifth graded stakes winner from 617 starters, so he's not a prolific winner producer at that level. Miss Steele is the only stakes winner out of a mare by her broodmare sire, Shagny, a once-raced son of Blushing Groom, who also has only two stakes winners to his name as a sire. Turning to the female line, the only previous black-type winner under the first three dams is Steel Phoenix, a three-quarter brother to Miss Steele's dam, Shu' Shu' Lara. 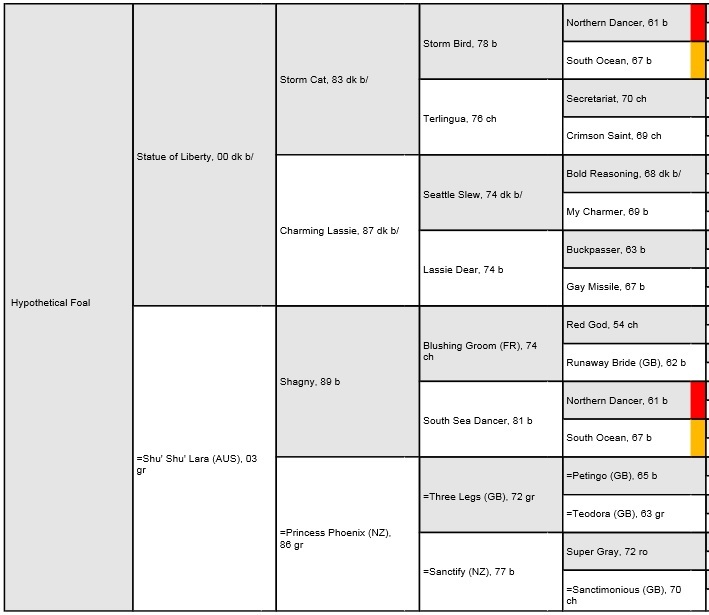 If one has the general feeling that this is a rather modest background for a stakes winner, at least in terms of the racing quality of her dam, you would be right however the mating does have a few factors that make it stand out from the ordinary. Although Shagny achieved little on either the racetrack or the breeding shed, he was a very well-bred horse, and in addition to being by Blushing Groom, he's out of South Sea Dancer, a Northern Dancer mare who is a sister to none other than Statue of Liberty's grandsire, Storm Bird. In addition to having Storm Bird/South Sea Dancer (a grade one producer in her own right) 3 x 3, the Storm Cat segment of the pedigree receives more reinforcement through Super Gray, the sire of Miss Steele's third dam. He is by Nijinsky II (a Northern Dancer son with a similar background to Storm Bird), out of a half-sister to Storm Cat's broodmare sire, Secretariat (and to Sir Gaylord, who is also in Statue of Liberty's pedigree). Of course, this is just an anecdotal example, and as the saying goes, "an ounce of fact is worth a ton of assertion." TrueNicks is a data driven company and as such we will be endeavoring to produce products that we help solve some of the dilemmas and enigmas presented by the inbreeding puzzle. While we have introduced the Coefficient of Inbreeding and Coefficient of Relatedness to the TrueNicks reports, in months to come we hope to introduce some more products that will hopefully begin to answer the question "is inbreeding to x a good thing?" and give the answer the context it requires.